myViolet.com is part of our goal to develop new and exciting outlets for African Violet growers. We created this site to be a multi-dimensional resource that is truly functional for all African Violet growers. With great features like Dr. Optimara, MyViolet.com is our contribuition to help the African Violet community connect with one another and to learn new ways to enjoy your African Violet. 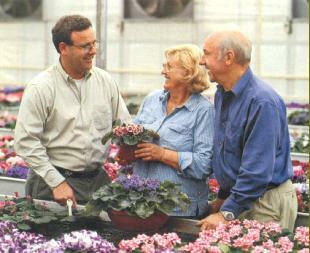 Optimara is the world's largest grower of African Violets. With the largest selection of full-blooming varieties offered, Optimara continues to advance the industry through the development of new African Violet characteristics and innovative growing techniques that have been refined over years of research and development. We strive to offer our customers a unique selection of African Violets in a beautiful product line. Optimara was founded in 1904, by Martin Dorrenbach in Isselburg, in the lower Rhein Valley of Germany. By the 1930's, the son-in-law and horticulturist, Hermann Holtkamp, Sr. started to breed his first Saintpaulias on only one square meter (10.76 square feet) of greenhouse space. After the war, Hermann Holtkamp Sr. intensified his breeding efforts and by the early part of 1950's, the first real success gave the breeder hope for the plant's future. At the time, Mr. Holtkamp said that the African Violet would be the potted plant of the future. Our company grew many different crops, later to be replaced, one by one, by the African Violet. In 1961, the name of the company changed from Dorrenbach-Holtkamp Greenhouses to Hermann Holtkamp, KG. In 1977, Holtkamp Greenhouses was founded in Nashville, Tennessee, and the Optimara brand name was introduced to the American consumer. Optimara continues to be based out of Nashville, TN and the Holtkamp family remains active in all areas of the business. Optimara African Violets are available at national and local retailers across the country.